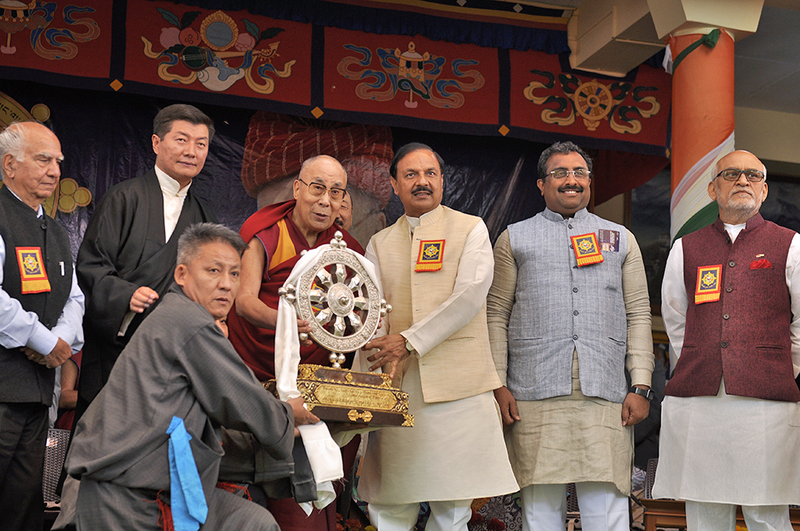 (TibetanReview.net, Apr02, 2018) – In an apparent indication of not having totally surrendered to China on the issue of Tibet and in an obvious reversal of an earlier order, political leaders of India did attend a high profile event organized by the Central Tibetan Administration at Dharamshala, Himachala Pradesh, on Mar 31. Forced to shift from a national sports complex in capital New Delhi, with senior government leaders being especially asked not to attend the event to avoid the risk of offending China, the ‘Thank You India’ year, marking the start of the Dalai Lama’s 60th year in exile, was launched in a relatively robust event on the small courtyard of the Tsuglakhang, the main Buddhist temple in Dharamshala, Himachal Pradesh. Central and state political leaders did attend the event, perhaps suggesting that the order asking them to excuse themselves was tacitly acknowledged as having gone a bit too far, all the more because some saw it as a snub to a person of the Dalai Lama’s stature and by others as overindulgence towards a geopolitical rival that shows little reciprocal concern towards its interests. A Feb 26 directive from India’s top bureaucrat, the Cabinet Secretary, asking senior federal and state political leaders not to attend the event so as not to jeopardize ties with China, stood either ignored or diluted at the event. The chief guest was Mr Mahesh Sharma, India’s junior minister for Culture, Tourism and Civil Aviation, while Mr Ram Madhav, General Secretary of India’s ruling Bharatiya Janata Party, was the Guest of Honour. Also present was Mr Shanta Kumar, the state’s former chief minister and current MP representing the local Kangra District in India’s parliament where he is the Convenor of the All Party Indian Parliamentary Forum for Tibet. Mr Satyavrat Chaturvedi, a Rajya Sabha MP from India’s opposition Congress party, also attended the event. So also Mr RK Khrimey, a former minister in Arunachal Pradesh state, in his capacity as the National Convener of the Core Group for the Tibetan Cause, an umbrella body for Tibet support groups across India. Mr Kishen Kapoor, a State government minister and the local MLA, was also present. 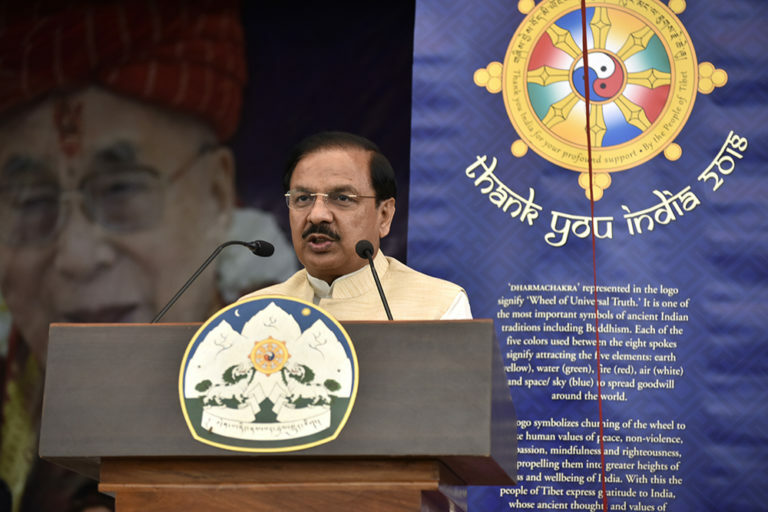 Most of the Speakers, including chief guest Mahesh Sharma and President Lobsang Sangay of the Central Tibetan administration, called for change of heart in Beijing to make it possible for the Dalai Lama to return to his homeland. 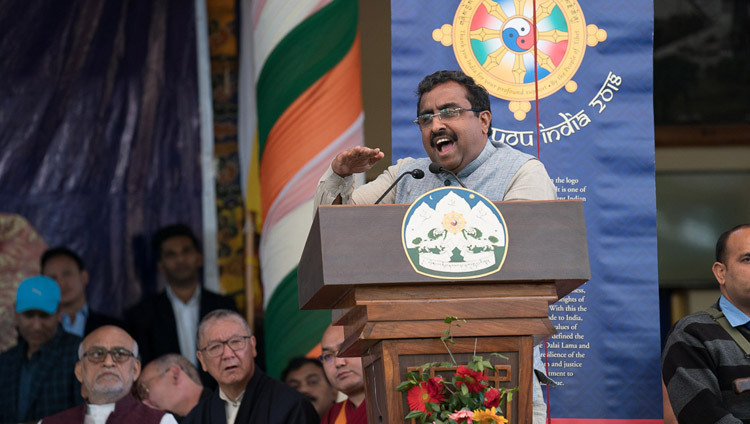 Guest of honour Ram Madhav said the Dalai Lama was not a refugee but a family member. He thanked Jawaharlal Nehru, India’s first Prime Minister, for providing asylum to the Dalai Lama in the country. Senior BJP leader Shanta Kumar called it a tragedy that the Dalai Lama had to come to India, leaving his country. “But you graced us and made this land pious and made it pilgrimage. Hey God change China’s heart to change its approach to the Dalai Lama,” indianexpress.com Mar 31 quoted him as saying.